Holey Moley has landed on the Gold Coast and we've brought a hole lot of fun with us! 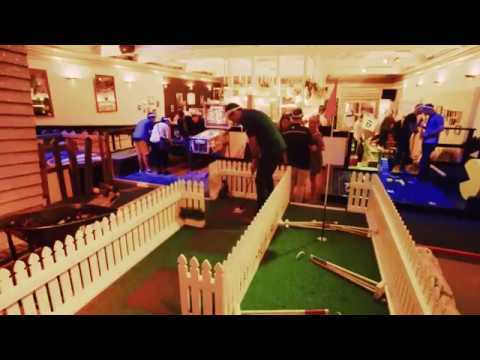 We’re mini golf with a bar, plus karaoke. What more could you ask for? Right on Cavill Avenue, Holey Moley Surfers Paradise has teed up 18 unique and crazy holes for you to putt your stuff around. Whether you’re strutting your putt or smashing out some tunes in our private karaoke room, you’ll be able to do it while sipping the night away courtesy of our fully-equipped cocktail bar. Get ready – your all-in karaoke, bar and mini golf experience has just teed off! We are open as normal over the holiday period except Good Friday April 19th. We will be open 11am - 11pm. From 5pm Monday, spend $7 on food and we’ll give you 9 Holes of Mini-Golf for free so you can really putt loose! All day Tuesday we are doing 18 holes of golf and unlimited karaoke for $30! How's that for a deal? Universi-tee off each Wednesday from 5pm, with 18 Holes of Mini-Golf for $10 when you bring your Tertiary ID along. Head into Holey Moley every Thursday and if you grab 9 Holes of Mini-Golf, we’ll chuck in another 9 holes all day long. Hows that for generous? Okay, let’s get to the point. What's the deal with alcohol at Holey Moley Surfers Paradise? The rumours are true. We have a fully licensed bar and a delicious list of cocktails. You ALWAYS need your ID to enter our Surfers Paradise venue and they will be scanned as of 8pm (Even if you think you are too old, this also applies to you). What can we do before and after our rounds at Holey Moley Surfers Paradise? How do I book Holey Moley Surfers Paradise? How long does the golf stuff take at Holey Moley Surfers Paradise? What if I wanna bring the whole squad to Holey Moley Surfers Paradise? Can I bring the kids to Holey Moley Surfers Paradise? Where do I park at Holey Moley Surfers Paradise? The Circle on Cavill Carpark is the best place to drop your buggy. Enter via Ferny Ave or Surfers Paradise Boulevard. Can I just turn up to Holey Moley Surfers Paradise? Can I cancel or change my booking for Holey Moley Surfers Paradise? How do I get to Holey Moley Surfers Paradise on public transport? Surfers Paradise Bus Services will take you right to us. Jump on the Queensland public transport journey planner here and map out your journey. Do I need to bring my ID to Holey Moley Surfers Paradise? If you look under the age of 25, you will need ID to enter the venue after 8pm. We accept Australian Drivers Licenses/Proof of Age cards or International Passports.